The acclaimed 2011 Deus Ex: Human Revolution is getting a director's cut edition of the game for Wii U. The thing people hated most about that game? It's getting fixed, along with some other improvements. I opened the box, and within it discovered a sheaf of love letters. The Director's Cut offers a full slate of Wii U GamePad features including touch-screen hacking, interactive map editing, augmented sniping, grenade throwbacks and many other neural hub enhancements. Along with in-depth Miiverse™ integration, the Director's Cut also provides access to developer commentaries and in-game guides. Tongs's Rescue mission and the entire Missing Link chapter have also been integrated seamlessly into the narrative flow of the Director's Cut. 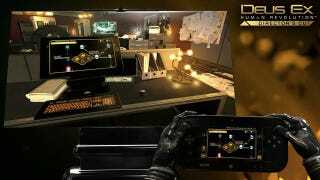 Other core Deus Ex: Human Revolution augmentations include overhauled boss fights, refined game balance and combat, improved AI, and striking visual improvements which make this edition the best looking and most immersive Deus Ex experience available. Each of the game's three boss fights have had their map layouts reworked to provide players with alternative potential strategies. New hacking challenges are available to players who focus on hacking, and stealth options are available to those who focus on stealth. No release date. The game's publisher, SquareEnix says it is "coming soon." The game will be at PAX East in Boston this weekend. We'll have more from the show. This is the latest in a batch of ports and updated versions of games that came to Xbox 360 and PS3 that are being brought to Wii U. The system's November launch saw the release of 2011's Batman: Arkham City with a new armor mode for its lead characters. This week sees the release of a beefed up version of the Wii game Monster Hunter 3, also for Nintendo's new console.